The passenger compartment remained stable during the frontal impact and the dummy readings indicated good protection of the knees and femurs of both driver and passenger. With the use of additional tests, Honda were able to demonstrate that occupants of different sizes and those sat in different seating positions would have a similar level of protection against upper leg injuries. In the side barrier impact, the protection offered to all body regions was good. In the more severe side pole impact, chest protection was adequate. Whiplash protection in rear impacts was good. Space is limited in the rear seats of the CR-Z and Honda’s recommended child restraints will not fit if the front seats are set to the Euro NCAP test position. Therefore, separate tests were done to determine adult occupant protection (using Euro NCAP's standard front seat positions) and child occupant protection (for which the front seats were moved forward to accommodate the child restraints). Users should ensure that the front seats are moved as far forward as is practicable when installing child restraints in the rear. In the front and side impacts, the heads of both children were protected by the child restraints. A permanent label clearly warns of the dangers of using that seating position for a rearward facing child seat without first disabling the airbag. The CR-Z is equipped with a switch that disables the passenger airbag to allow a rearward facing restraint to be used in that seating position. Clear information is provided to the driver regarding the status of the airbag and the risks associated with incorrect use. The ISOFIX and top tether anchorages in the rear seats were well marked and the CR-Z is certified for the installation of universal child restraints. Most of the bumper provided good protection along with the whole of the bonnet front edge. The area of the bonnet where a child or small adult's head would impact was good, but the area for adults offered various levels of protection. 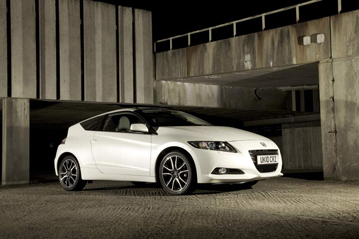 Honda have made electronic stability control (ESC) standard fitment on the CR-Z throughout all European countries. Additionally, all seats in the vehicle were protected by a smart seat belt reminder system.